Video : Cards 4 Men – Pawsome Dog! Hiya, today I have the second installment in my new Cards 4 Men series and this time I am having fun with a Neat & Tangled set called ‘Woof’, these little fellas totally make me smile and I just know that one day instead of flying this little dog will be swimming… but that’ll be for another video. Other Supplies: Copic Markers – 0. R11,14,22. B000,01. W4,4. T0. YG11. E31,33,50. YR04. Y17. Prismacolor Pencil – 70% Warm Grey. Retired sets – Annabelle Stamps – Scribble Scrabble and The Alley Way Stamps – Party Pooper. I don’t know what I was thinking, I don’t think I’ve ever seen blue roses before but I thought they would look pretty and so not the usual ‘red and pink’ regular Valentine’s theme. 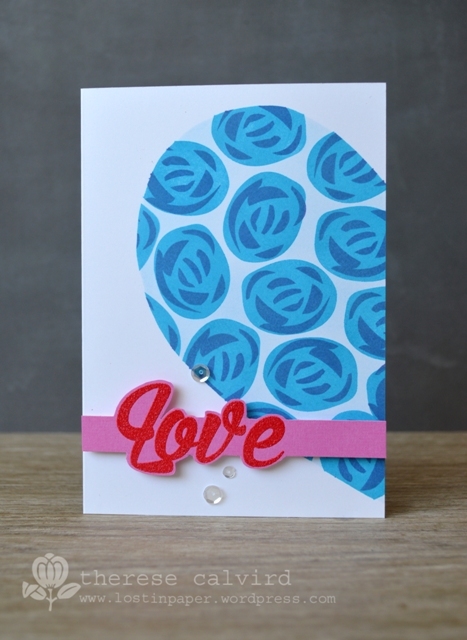 I was lucky to have this card published with the Australian Cardmaking, Stamping & Papercraft magazine and thought I would share it today… so, Happy Valentines Day to you ALL! Other Supplies: Stamps – TAWS – BIG Time. 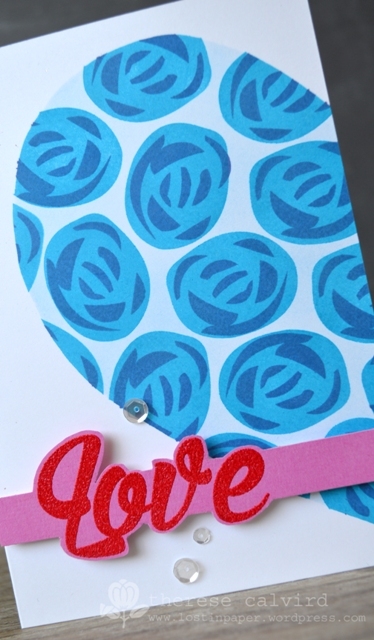 Cardstock American Crafts – Lipgloss. Video : Adding Gold and a sad farewell. Sadly this is my last post as part of The Alley Way Stamps Youtube Specialist team, and I gotta say that it really has been a blast. This has been truly one of the most social, fun and organized teams, and I know that I will miss them all. 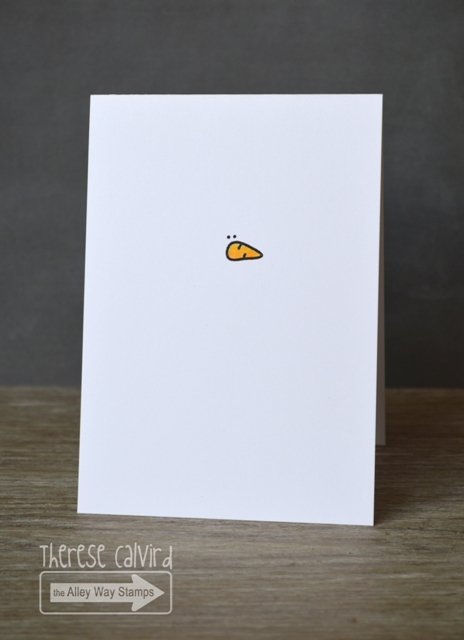 So today I thought I would share a card to send my love to the team (especially to Ali and Chrissie) and beware, I will totally be blog stalking. All these fab stamps can be found in clearance at The Alley Way Stamps, so be quick! Other Supplies: The Alley Way Stamps – Swee-Tea Distress Inks – Spun Sugar, Picked Raspberry, Festive Berries, Pumice Stone. Video : Keeping it warm this Christmas! Snow is not something we have here in Australia at Christmas, so all those beautiful scenes / snowflakes / Wintery wishes, they are a little bit hard to sell when it’s a day at the beach with seafood and a BBQ for us. So when I saw this little fella I thought the ‘warm wishes’ he was perfect lol. Keeping it CAS at The Alley Way Stamps blog today. Head to The Alley Way Stamps for some great bargains and some fabulous stamps but you really do need to be quick! ps. 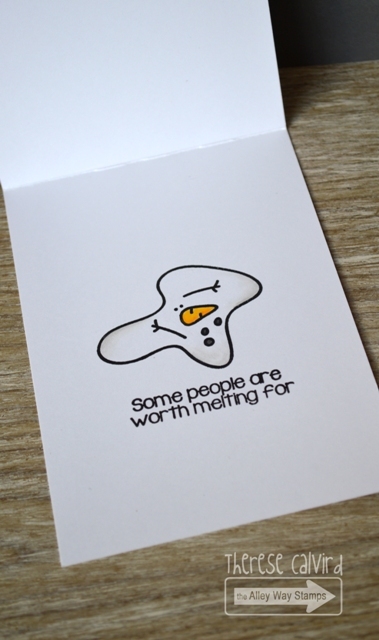 Are you melting yet? Other Supplies: Stamps – The Alley Way Stamps – Melt Your Heart Out. Prismacolor Pencils – Warm Grey 20%, Spanish Orange, Yellowed Orange. Video : Quick & Easy Masculine Designs! Oh my, I couldn’t believe that my stash of masculine cards is pretty much gone, I think there has been way too much Christmas card making going on round here, so I had to fix it and real quick as I have a few December birthdays to sort. So I decided to film as I created so you can watch the process and learn some ‘boy’ design card tips lol. Other Supplies: The Alley Way Stamps – Lite Bright / Something’s Fishy. Prismacolor Pencils – Warm Grey 20,50%, French Grey 50%, Putty Beige, Chartreuse, Apple Green, Cloud Blue, Black Raspberry. 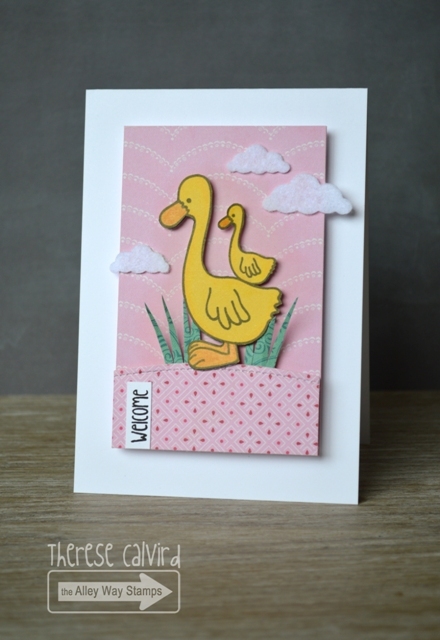 I know it’s meant to be a goose, but I wanted a duck and cause it’s yellow it’s a duck… now. I had so much fun creating my little ‘old school’ storybook scene and when you want a little simple shading then Prisma’s are my go to choice. 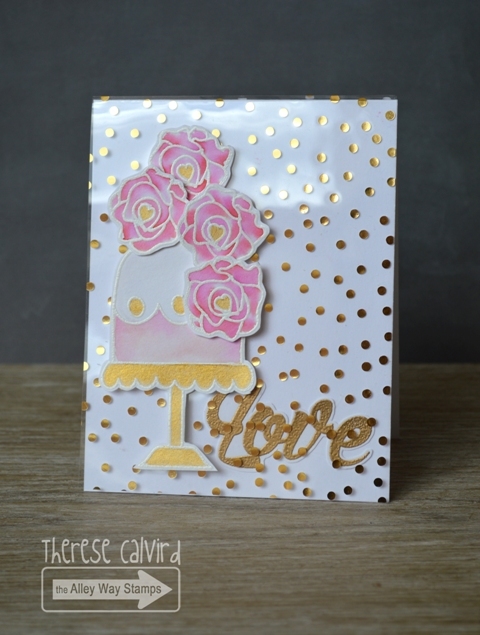 You can find this card over at The Alley Way Stamps Blog. And while I’m here you may have already heard that TAWS is sadly closing it’s doors, but that means that you can buy their fun stamps at an incredible 40% discount, so head on over! You can find these fab stamps over at The Alley Way Stamps. 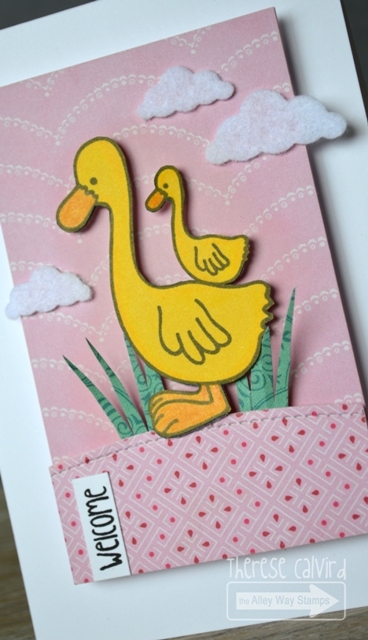 Other Supplies: Stamps – The Alley Way Stamps – Just Ducky. Prismacolor Pencils – Goldenrod, Sunburst Yellow, Canary Yellow. Paper Pad – Echo Park – Jack & Jill. White felt.